Making connections at the annual Richhill Village Fete last year are from left, Ben Murnion (10), Rebecca Kenny (10) and Thomas Kenny (8). INPT37-204. Foodies and dog lovers await with eager anticipation Richhill’s annual Village Fete next week. 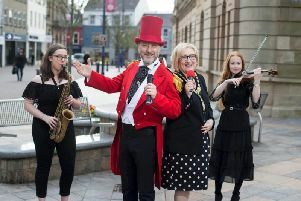 With a wealth of stalls selling everything from home baked breads to local crafts, the Fete, in Richhill Square will take place on September 8 at 10am. It will be officially opened at 11am by Angeline Murphy from Firmus Energy, who are sponsoring the event, ably assisted by Mr Tayto who is making his first special guest appearance this year. There will be more than 30 stalls selling all sorts including fruit and veg, shrubs and flowers. The stalls will be in the marquee, around the Square and in the Colthurst Hall. Music is from Ballytyrone Accordion Band. Young people will be able to take part in a number of organised games. The dog show sponsored by Mackle Pet Foods with prizes for the best dog, the one with the waggiest tail and the best dressed. Registration for that is from 11 00am to 11 45am. You won’t go hungry. The ladies of the Parish are offering tea and sticky buns and you can get burgers, hot dogs, creps, ice cream, freshly baked local breads and cakes. Auction viewing is from 10am with the Auction beginning at 2pm. Your auction catalogue including your bidding card is £1. This is a community event organised by a community-minded church. They invite you to come and join them for a good day’s craic. St. Matthew’s Church will be open for viewing during the day from 10am to 4pm . Originally a market house, which was converted into a Church in 1837. Transept and Chancel were added in 1862. In 1912 Messrs A C Simpson of Armagh built the 62 ft. tower then it became the most conspicuous feature of the village. A chiming clock was added to the tower in 1959. The church has a number of beautiful stained glass windows, including two new memorial windows recently dedicated in memory of two former parishioners Charles and Elizabeth Rowntree, Stonebridge, Richhill and Rev David Somerville, Rector 2013- 2016.